(Medeshi) - Two people including the driver and assistant driver were killed yesterday after the fuel tanker they were driving fell off a bridge between Berbera and Sheikh. 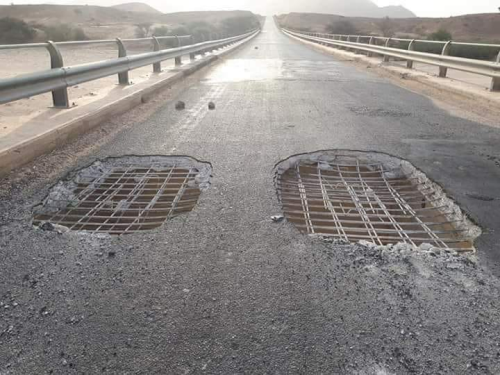 The bridge has a huge pot hole (See photo) with only the wire mesh visible while both the asphalt and concrete were worn out due to lack of maintenance. The traffic officer who attended the accident told the local media that the cause of the accidents like this are due to the drivers speeding on the roads in the area. The traffic officer failed to acknowledge the poor maintenance of the roads and the bridges although vehicle owners pay road tax that is meant for maintaining the roads. Dozens of people die yearly due to accidents on the asphalted roads in the country. Yet the ministry of public works has failed to address the issue of road safety and road maintenance. It is about time that action is taken against the government officials that have failed in delivering their duty towards the safety of the public. They should be held accountable for the loss of lives on the public roads.